Eating a foods with balanced nutrition and rich in calcium can prevent osteoporosis. Oosteoporosis is a disease characterized by reduced bone mass and changes in bone tissue microarchitecture. Osteoporosis is not just a reduction in bone density but also decreased bone strength. In osteoporosis the bone damage faster than improvements made by the body. Osteoporosis is often called bone loss. The bones are often fractured or broken such as: spinal vertebrae, pelvis, legs, and wrist forearm. Early prevention of osteoporosis can be done in various ways, such as, nutrient intake associated with bone formation such as calcium, vitamin D, and regular physical activity is essential for bone formation. 1. Milk and milk products such as cheese, yogurt or skim milk consumption is mandatory for those who do not want to develop osteoporosis. 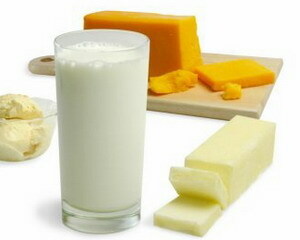 Because in these foods contained calcium and proteins that strengthen and nourish the bone. 2. Nuts. Do not be lazy to eat nuts that are rich in calcium, magnesium, manganese, and phosphorus. Especially almonds and pistachio nuts are a source of calcium. 3. Vegetables. These include broccoli, cauliflower, and beets should be routinely consumed every day for strong bones. 5. A dates. Like eating dates? The good news for you. For date source of calcium and magnesium which increases your body's bone density. 6. Sunlight. It's not the food, but the sun is a source of vitamin D is the most easy and cheap to get. Make sure you are quite 'sun' in the morning in order to maintain bone strength. 7. Fruits, such as oranges, guava, strawberry, and pineapple. These fruits provide vitamin C, which can strengthen the bones. Do not forget also bananas and apples. 8. Dark green vegetables are one osteoporosis-fighting foods. But beware spinach. Because it turns out there oxalates in it that turns prevents absorption of calcium by the body. 10. Eggs. In addition to protein, eggs also one of the foods that contain vitamin D naturally. 11. Physical activity. Although it is not the kind of food, but regular physical activity also prevent bone weakening. Therefore do not be lazy to pick up the stairs instead of using elevators in buildings. 12. Omega-3. You can find it in pumpkin seeds, flax seeds, or fish oil. Besides osteoporosis, omega-3 is also going against rheumatic diseases and joint pain. 13. Supplements. Lazy eating food? Drink only calcium supplements regularly to improve bone structure. 14. Fish, especially oily (oily fish) such as salmon, sardines, and tuna are rich in calcium and other minerals. 15. Other calcium foods, such as orange juice, a drink made from soy products, tofu, and also starch. Everything is the best source of calcium to fight osteoporosis.